Visits: 49880 persons viewed this recipe. Mambazha Pulissery – a traditional sweet and sour ripe mango curry. It is usually served as an accompaniment to rice. Before you start with the preparation, please read the tips carefully. Peel the mangoes. If it is not pulissery mambazham (small ripe mango) dice it. Slice shallots and slit green chillies length wise. Grind grated coconut, garlic and cumin seeds into fine paste. Beat the curd to make it smooth and keep aside. Cook the mangoes in a covered vessel by adding turmeric powder, green chillies, salt and enough water to cover the mangoes (about 10 minutes in a medium flame). When it is done, open the lid and mash a bit of the pieces. Add the ground paste and combine well. Simmer it by stirring occasionally (do not let it boil). Add the beaten curd and combine it. Remove from the flame and keep aside. Heat 1 table spoon of coconut oil in a cooking pan and put mustard and fenugreek seeds. When it splutters, add broken dry red chillies and stir for few seconds. Put shallots and curry leaves. Saute till it turns golden brown. Add this to the prepared mambazha pulissery. 1) For the authentic taste of traditional Kerala Mambazha Pulissery, use the “pulissery mambazham” – a small ripe mango to prepare this dish. If it is not available you could use any other ripe mango (1 No is enough). 2) If the mango is not enough sweet, add little sugar to it for the better taste. Thank you so much.. I love this dish and this is the first time I am preparing it on my own with the help of your recipe. You are welcome Noori. I am glad that you loved it and you prepared it with the help of my recipe. Hope you will like other recipes too. Thanks for sharing your feedback. Mambazha pulissery serikum kalaki… great taste with palakadan matta rice…. Thank you so much Mr. Shaan Geo, I also like cooking, I must learn more, if you help me? You wrote any book? plzz send me name of the book..! or still not you wrote book, this is the better time plzz start for me. Have a nice day. Thanks, Your brother. Love to eat Kerala recipes. Today I am trying for mambazha puliseri. Thank you for your awesome recipes. Vidya, Both are good. As I like garlic very much, I usually prepare mambazha pulisery with garlic. Anyway, please share your experience. 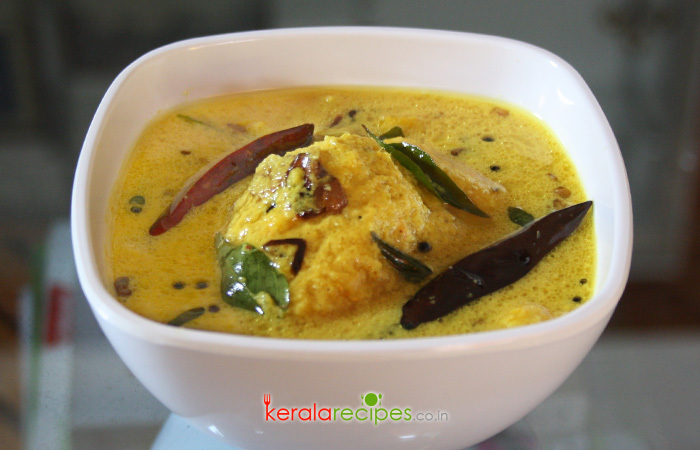 I love to prepare Kerala ‘s authentic dishes. One of them is mambazha pulissery… with the help of your clear instructions I’m sure it will be easy. Thank you Shaan. Hope it turns out to be as delicious as you prepare!! Hi Shanchetta, pls try to replace the word ‘cumin’ with big cumin or small cumin and all of your recipes. This making a big confusion. Salma, Thanks for the suggestion. I will do the necessary corrections as early as possible. Sorry for making it confused. I really liked your recipe! It give me a nice experience, thank u so much, expecting good simple recipes like this. Anu, Thanks for the feedback. I will try to post more simple recipes. Hope to see you here often. Being a malayali never lived in Kerala. But I always relished This cuisine. I am trying this for the first time through your site for my in laws and friends.Hope everything goes well. In the authentic kerala dish, we do not add garlic, cumin and shallots; grind coconut with roasted red chillies and roasted fenugreek seeds. Tastes even more traditional. Vijaya, Thanks for the suggestion and tip.